President Reiss presents Nan and Roy Ans with a hand-set broadsheet of Jehanne Dubrow's poem commissioned for the occasion. 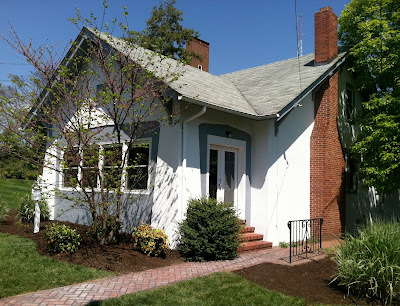 The couple made the lead gift to bring the long-awaited Hillel House into being. 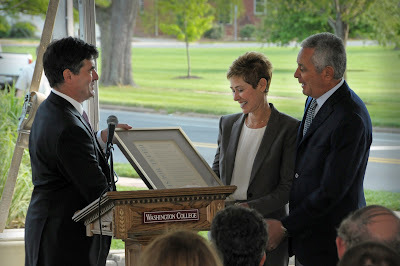 CHESTERTOWN, MD—Washington College dedicated its new Hillel House Friday, April 20, in a program that featured remarks by the national president of Hillel, a poem written for the occasion by award-winning poet Jehanne Dubrow, and the installation of the mezuzah at the front door. Located at 313 Washington Avenue, the charming gray-and-white bungalow faces the Campus Lawn. Nearly 200 people gathered for the dedication ceremony, which was held outside beneath a white tent. The house bears the name of Washington College alumnus Roy P. Ans ’63, M.D., and his wife, Nan. Roy Ans chairs the committee that has raised funds to renovate and endow the House. A retired ob-gyn doctor who lives in Florida, Dr. Ans is a member of the College’s Society of Visitors & Governors and a longtime supporter of an enhanced Jewish life at Washington College. In 2006, he endowed the Roy P. Ans Fellowship in Jewish American Studies. Jehanne Dubrow, assistant professor of creative writing and English and interim director of the Rose O’Neill Literary House, read her prose poem commissioned for the occasion, referencing her mother’s family and their personal journey as a window into the universal Jewish story of Diaspora and the search for “home.” President Reiss presented the Anses with a framed and signed limited-edition broadside of Dubrow’s poem, which master printer Michael Kaylor set by hand in the press room of the Rose O’Neill Literary House. Following the remarks, the crowd gathered around the entrance to the new Hillel House to watch Rabbi Peter E. Hyman, MAHL, DD, of Temple B’nai Israel in Easton, and Washington College alumnus Lawrence Golub ’63 affix the mezuzah to the doorframe. Dr. Gary Schiff, a cantor in the Chestertown Havurah and an adjunct professor at the College, recited the traditional blessing (likboah mezuzah) and prayer of thanks (Shehecheyanu). Guests then entered the house for a reception and, for many, a first look around. The College continues to raise funds toward its goal of $350,000, not only to cover the cost of the renovations but also to fund an endowment for the House and its programming. Joining Dr. Ans on the fundraising committee are fellow alumni Jonathan D. Bookbinder ’10, Beth Kahn Leaman’73, Peter D. Maller ’90 and Mark A. Schulman ’67, Ph.D. For more information: http://hillel.washcoll.edu/. steerage ticket crumpled in our hands. Jehanne Dubrow is the recipient of numerous poetry awards and honors, including a Sosland Foundation Fellowship from the Center for Advanced Holocaust Studies at the U.S. Holocaust Memorial Museum. She recently won the Poetry Society of America’s 2012 Alice Fay Di Castagnola Award for her fifth collection, a manuscript-in-progress entitled The Arranged Marriage.